See the Light has been producing top-notch, high-quality art instruction videos for many years now, and we feel very blessed to be allowed to review one of their new See the Light Art Projects DVDs. We chose Repeated Sweets—The Art of American Pop artist Wayne Thiebaud . Can you guess why we sweet tooths would be drawn to this choice? Yes, indeed. There are nine new Art Project DVDs from See the Light. This one appealed to us because of the subject matter and the style of painting taught. 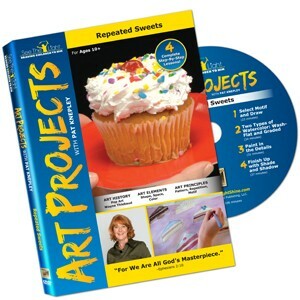 For the Repeated Sweets Art Project DVD, the student is to choose a “sweet” dessert like a cupcake, doughnut, or piece of cake, etc., and follow Pat Knepley’s instructions on how to do this project. Pat Knepley is a gifted art instructor and a wonderful presenter, and my daughter was drawn to her immediately. Each DVD contains four steps to creating the final project. It is recommended that the student do one lesson per week, but my daughter, the artsy one, could not wait an entire week between lessons, so she completed the DVD in two weeks. All the materials listed are easily found at your local stores, and they also offer resources online to order them as well. Step 1 involves sketching out some different kinds of sweets to consider painting for the final project. Led by Pat, Abbey sketched a doughnut, a piece of a cake, an ice cream cone, a popsicle and a piece of cake. All along the way, Pat is teaching methodology for painting with watercolors. Here, she has the students practice intensity of the watercolors. Step 2 involves painting the five different choices and cutting them out. From there, Abbey chose to paint doughnuts for her final project. Step 3 involves getting the doughnuts on her final canvas in a repeated pattern, as was the style of the featured artist Wayne Thiebaud. Step 4 involves painting the final project. It’s not just slapping paint on the canvas; it is a very methodical watercolor instruction, and Abbey learned a TON about how best to work with the unique characteristics of watercolor paints. She learned how to let each color dry between steps to avoid overlapping. She learned how to make the colors stronger or lighter based on the amount of water in her brush. She learned to recognize pattern in works of art beyond this lesson. Very clear, step-by-step instructions lead the student effortlessly from one lesson to the next. Pat Knepley is extremely charming, and my daughter felt as if she was speaking directly to her. Art history of the featured artist is discussed in great detail. We spent a lot of time researching Wayne Thiebaud and finding other works of art by him. Most importantly, at the end of each lesson, Pat Knepley walks your student through a Bible verse and how that verse relates to each step in the project. Our only disappointment in the DVD is that we didn’t want it to end. We are now trying to decide which new See the Light product to try next! And although not part of the boxed DVD set, there is one other Art Project DVD available for the doodler in all of us: Cartooning! Because my daughter is such a lover of all things art, we have tried many different art DVDs on the market. To date, See the Light is by far her favorite. I encourage you to give one of these new Art Project DVDs a try. 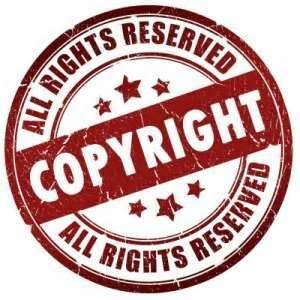 Want to hear about how some of the other titles were used by other homeschooling families? Click on the flashing banner below and learn more! Great post. How fun to do sweets! We got to use the Paper Jungle and loved the Bible time at the end of each lesson too. Great videos! Thank you for commenting, Leslie! It was indeed a great video! I am Angie McFarren, Pat Holt's associate. May I use some of your photos in this review for two of the SEE THE LIGHT's Pinterest Boards? Yes, Angie, my pleasure. Thank you! Thanks April. How old was Abbey when she completed the project? She did a wonderful job. She was 9 years old at this time! She still loves STL and does their lessons many times a month!